Condition: Excellent. Wide margins. Flattened. Verso: blank. 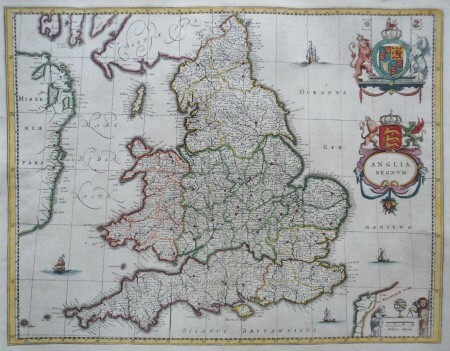 This fine map of England and Wales was introduced by Willem Blaeu in advance of his rivals', Hondius and Jansson, similar map. The outline and place names are based on Speed. It is decorated with four ships, a scale of miles flanked by sheep and a cherub, and two finely engraved coats of arms, of Great Britain and of England, surmounting the title cartouche.